"After a hectic day at the office—or on the playground—a comfortable, fun pair of pajamas just makes things right! Our pajamas are cozy, cheerful and comfortable. They’re sure to make you happy and relaxed. Once you put on a pair of pajamas from The Pajama Company, you’ll feel better. When you’re wearing pajamas, the world is a happier place!" "Fall asleep in cozy flannel from Hatley Nature. 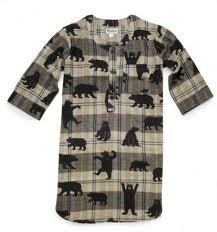 Dream of bear fun in this 100% cotton flannel nightshirt with an overall "Bears on Plaid" print, front pocket, three-button placket and bottom hem detailing." What we thought: This nightshirt is super soft and feels nice and cozy. It is a pretty good length too, almost to the knee, so even if you're a little modest, this would be just fine to wear around the house. The Pajama Company has a large selection of pjs for the whole family. Whether you are looking for cozy flannel or cute cotton, they've got you covered. They even have footie pajamas in all sizes:) Pajamas always make great gifts for the family! ABCD Diaries gives The Pajama Company an A+! Buy It: Find one-stop shopping for all your pj needs at The Pajama Company! Disclosure: ABCD Diaries was given a sample for review/giveaway purposes only. We were in no other way compensated. The opinions expressed in this post are ours and ours alone.